Currently on exhibit at the Alvarado Gallery is an eloquent, evocative and compelling collection of 26 photographs by Jerry Takigawa. Titled “Balanced Cultures,” Takigawa composes an autobiographical perspective that invites us to share his thoughts about his family’s life story in the context of two cultures—Japan and America. Takigawa’s social conscience was powerfully impacted by the “boxes of photographs, letters and artifacts” that his parents kept, documenting his family’s experience prior to and during WWII. Takigawa’s parents were forcibly removed from their home in Monterey and incarcerated at the Jerome concentration camp in Arkansas. Jerry’s mother and father did not want to start a family in camp, so they waited until they secured an early work release from the Jerome camp and moved to Chicago, IL where Jerry was born. Like many children of second-generation Nisei parents, Jerry grew up not hearing much from his parents about their experiences during WWII, especially the years in camp. This deafening silence was shattered some sixty years later when, following the passing of his father (2005) and mother (2011), Jerry discovered boxes of photos and documents his parents had left behind. A startling revelation for Jerry, the boxes contained evidence of the profound impact of war and American society on the Takigawa family: family ID tags issued by detention centers; his grandfather’s fish market on Fisherman’s Wharf; mother’s diary; family’s Azuma Tei restaurant on Franklin; FBI round-up in Monterey that sent his grandfather to Bismarck, ND; authorization for his parents’ early release from the Jerome concentration camp; baby Jerry with Mom & Dad in Chicago; three-generation family photos; dad’s registration card and military classification with the War Department; and myriad other family memorabilia. Takigawa incorporates many of these documents into his photographic narrative, creating both nuanced balance and tension. Most 2nd and 3rd generation Japanese Americans were admonished by parents to try to blend in with American culture, to avoid speaking Japanese, to go to church on Sunday, play American sports, and not make waves. Yet, by growing up with their parents, they naturally observed and emulated traditional values–gaman, shikataganai, haji–which Issei immigrants brought from the old country and largely passed on to Nisei children. This balance and tension is reflected in Takigawa’s photographs, aesthetically balancing Japanese and American values and symbols. Takigawa’s deep personal respect for nature is also reflected in “Balancing Cultures” as seen in his photographs using leaves. “Balancing Cultures” is a deeply personal experience that represents Takigawa’s evolving thoughts and perceptions about the reality and pervasiveness of discrimination in America. His research and reflection uncovered how war generates racial propaganda, mass hysteria, irrational fear, diminished social status, and injustice. At the same time, Takigawa uses art to cause tension in our psyche to act as a catalyst in searching for hope and reason to resolve our historical and societal dilemmas. 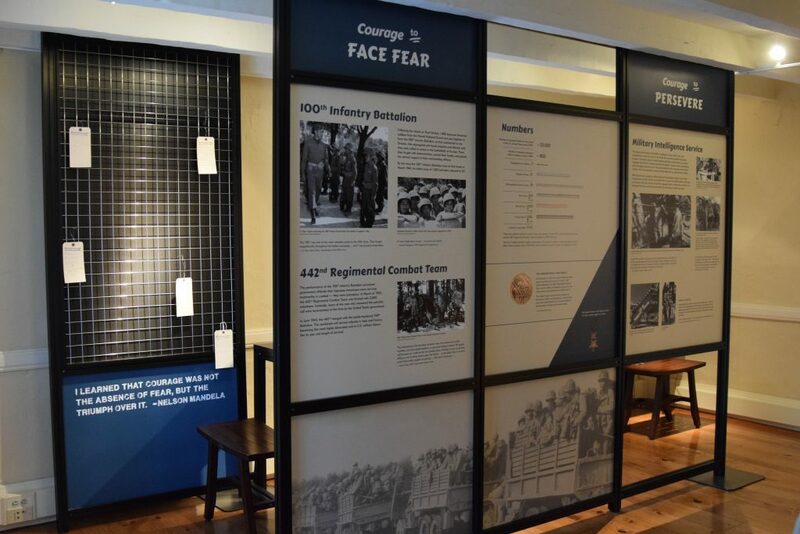 Courage and Compassion: Our Shared Story of the Japanese American World War II Experience chronicles the stories of Japanese Americans during and immediately after WWII, and highlights the bravery, integrity, and extraordinary support of Japanese Americans within 10 communities across the country during that turbulent time. Funded in part, by a grant from the Japanese American Confinement Sites Grant Program implemented through the National Parks Service, Courage and Compassion is made possible through a collaboration between Go For Broke National Education Center and select communities across the country. After the incarceration, many California communities vehemently rejected the Japanese American families and fought the return of their former Issei and Nisei neighbors to their towns. In that atmosphere of hatred and bigotry, more than 440 Monterey residents signed a public petition urging kindness and civility towards returning Japanese Americans. Among the signers of that petition were some remarkable names-Nobel laureate John Steinbeck, famed photographer Edward Weston, biologist Ed Ricketts. 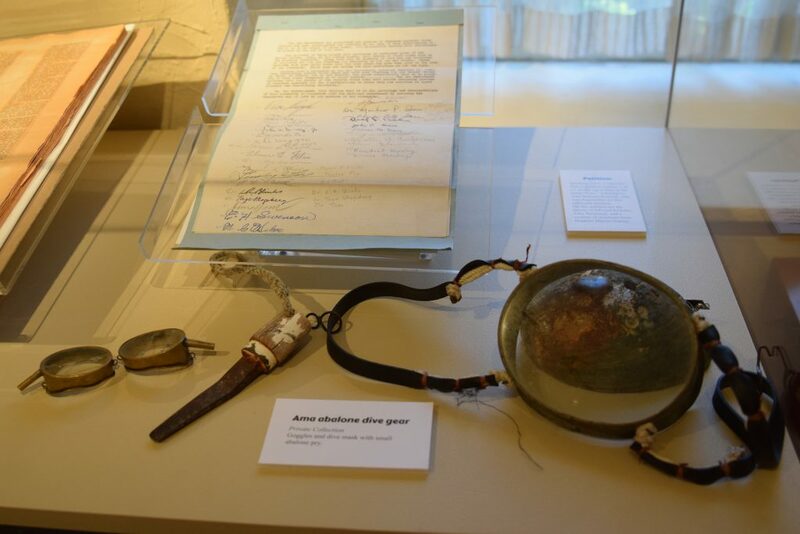 This extraordinary petition was rediscovered recently by local historian Tim Thomas; the history of this unusual act of conscience has been largely forgotten in Monterey. Learn this exciting local story and view the petition at Casa Gutierrez from September 22nd through October 27th! Learn more about Go For Broke National Education Center at goforbroke.org.